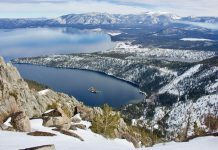 The Tahoe National Forest released the Draft Over-Snow Vehicle Use Designation Record of Decision (Draft Decision) and Final Environmental Impact Statement (Final EIS) on Feb. 8, according to a press release from the U.S. Forest Service. The Draft Decision and Final EIS were originally scheduled to be released on Jan 4, 2019, but were delayed due to the recent lapse in government funding. The Draft Decision designates areas on the Tahoe National Forest for cross-country, over-snow vehicle travel and specific snow trails for over-snow vehicle use, some of which are available for grooming. Cross-country, over-snow vehicle travel on 410,703 acres of Tahoe National Forest managed lands when there is adequate snow depth to avoid damage to natural and cultural resources. 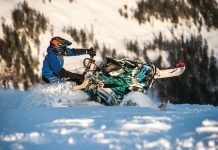 Over-snow vehicles include snowmobiles, tracked motorcycles, snow-cats, tracked all-terrain vehicles (ATVs) and tracked utility terrain vehicles (UTVs). Over-snow vehicle enthusiasts can continue to recreate in popular wintertime areas including Sierra Buttes/Lake Basin, Robinson Flat, Donner Summit, Yuba Pass, Carpenter Ridge, White Rock Lake and other locations. 135 additional miles of non-groomed, over-snow vehicle trails located outside of cross-country, designated areas. This includes 53 miles of easements crossing private property. 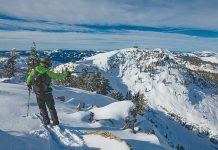 These trails will be subject to the same snow-depth requirement as cross-county, designated areas or, where there is an underlying Tahoe National Forest System road, a 6-inch snow depth requirement. Formal opportunities for public comment regarding the Over-Snow Vehicle Use Designation have passed. Additional details, including the entire Draft Decision, the Final EIS, the Legal Notice and project maps can be found at fs.usda.gov/project/?project=45914. The Tahoe Weekly has been covering the issue of public access to public lands, including the OSV plans in the Forest Service districts in the Tahoe Sierra – Tahoe Forest District, Eldorado Forest District, Lassen Forest District, Plumas Forest District and Stanislaus Forest District. 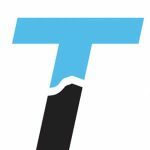 Full coverage of public access issues can be found at TheTahoeWeekly.com. Click on Back Country under the Out & About tab. Q: What is the basis for the 12- to 18- inch snow-depth requirement for trails designated available for grooming? A: The California State Parks’ Off-Highway Motor Vehicle Recreation Division snow-depth standards for grooming is currently 12 to 18 inches of snow. Much of the grooming of over-snow vehicle trails on the Tahoe National Forest is accomplished through grants from California State Parks. Thus, adherence to the state snow-depth standard is mandatory to accomplish grooming activities. A: The Tahoe National Forest received more than 2,200 comment letters in response to the Draft EIS. The content of all comments was read, considered in the development of the Draft Decision, and entered into the project record. Responses to public comments were categorized and organized by seven general topics and 74 subtopics and are documented in Appendix H (FEIS Volume III). Each comment was assigned a unique identifier number. Appendix H contains an alphabetical list of commenters and the identifier number assigned to each comment. To find your unique identifier number, your comment and the response, view Appendix H (Volume III of the Final EIS) located at fs.usda.gov/project/?project=45914. A: The draft decision is subject to two different objection processes because it includes both a project-level decision, as well as a Forest Plan amendment decision. For complete instructions on objection eligibility and how to object, see the Tahoe NF OSV Project Opportunity to Object Legal Notice at fs.usda.gov/project/?project=45914. A: In response to comments and public involvement, there were a number of changes made to the selected Alternative between the Draft EIS (April 2018) and the Draft Decision/Final EIS (February 2019). For details regarding changes to the Selected Alternative please see the Final EIS, Volume I, pp. 24 -25 at fs.usda.gov/project/?project=45914. Class 1 OSVs: These are vehicles that typically exert 1.5 psi or less. 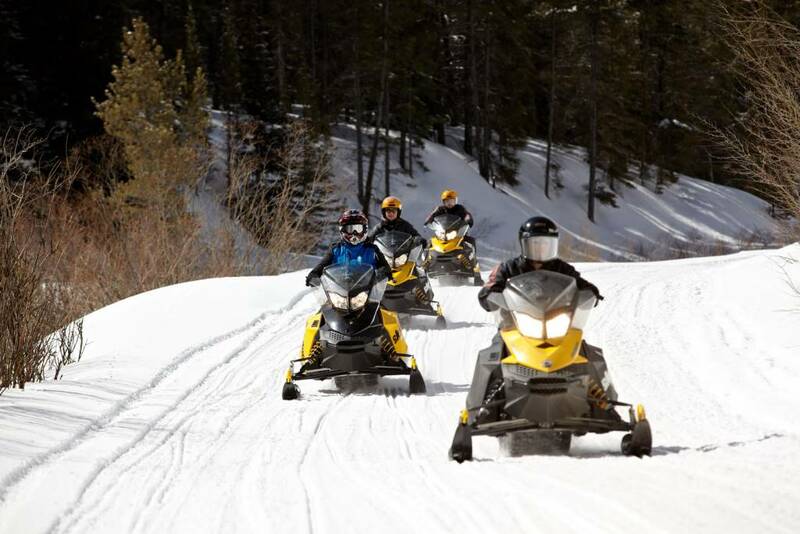 This includes snowmobiles, tracked motorcycles, snow-cats, tracked ATVs and tracked UTVs. Class 2 OSVs: These are OSVs that typically exert more than 1.5 psi. This includes tracked 4WD SUVs and tracked 4WD trucks. A: Approximately 99 miles of the PCT traverse the Tahoe National Forest. Of that, 76 miles of the PCT are on National Forest System lands. OSV use on the PCT is prohibited by the National Scenic Trails Act, P.L 90-543, Section 7(c). To provide a legal opportunity to cross the PCT, the Draft Decision provides 34 designated OSV crossings of varying crossing widths. The purpose of these crossings is to allow OSV users to get across the PCT in situations where OSV use is designated in areas located on either side of the trail. A: Of the 34 designated PCT crossings, 14 crossings will utilize underlying roads identified on the Tahoe National Forest’s Motor Vehicle Use Map and will be the width of the underlying road (approximately 14 feet). Twenty OSV crossings of the PCT will not utilize underlying roads and will range in width up to a ¼ mile. These wider crossings are located where snow conditions are highly variable such as areas prone to wind loading of snow and the formation of cornices. These wider crossings give OSV users options to select a safe crossing of the PCT. In all cases, OSV users would be required to cross the PCT at 90 degrees, or as close to 90 degrees as is safe to cross, to minimize the time and distance needed to cross the trail. Additionally, OSV users would be required to cross the PCT at the designated location, or as close to the designated location as is safe. These situational variance allowances for the PCT designated crossings were added to the Draft Decision/Final EIS based on comments to the Draft EIS and are designed for the safety of OSV users in highly variable snow conditions. A: Before this Over-Snow Vehicle Use Designation process, 636,000 acres were available for over-snow vehicle use, according to the Tahoe National Forest Land and Resource management Plan. Based on decades of managing and monitoring OSV use on the Tahoe National Forest, it is rare that there is consistent snow coverage to provide OSV opportunities below 5,000 foot elevation. Therefore, areas below 5,000 feet in elevation were generally not considered “adequate” for managed OSV use and were generally not included in the selected Alternative, which accounts for more than 145,000 acres previously designated as available for over-snow vehicle use.